Synonyms: Noccaea montana var. fendleri; Thlaspi fendleri. Identification status: 100% to species; variety needs verification. Although I don't have fruit, and so cannot key it out, these plants fit this species perfectly in every other respect (very short perennial plants, petioled basal leaves, round entire clasping cauline leaves, purplish sepals, and the appearance of the inflorescence) and this taxon is vouchered from this location or nearby. Most Utah specimens belong to var. montanum. Some specimens from the southern part of the state approach the more southern var. fendleri, which has styles longer than 2.5 mm in length, petals 6-13 mm long, and silicles 7-16 mm long and 4-9 mm wide. 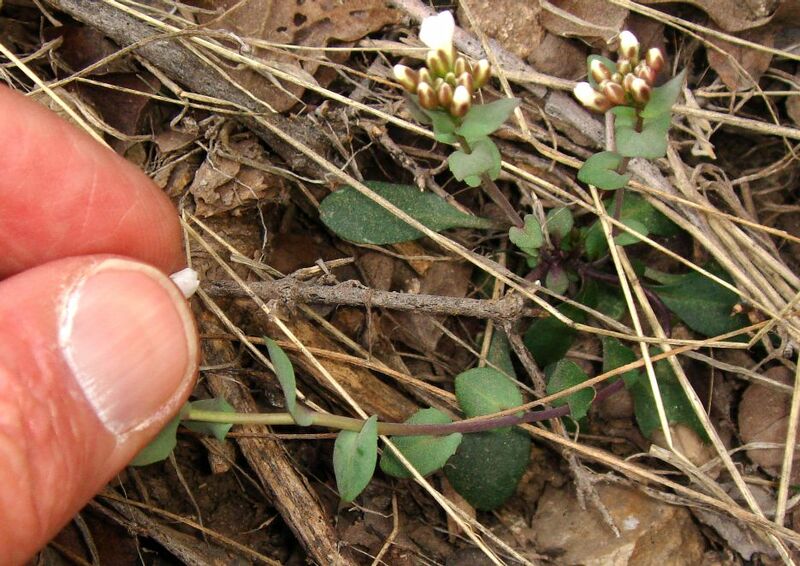 The Utah Flora gives the following measurements for var. montanum: petals 3.5-7.5 mm long; silicles 3-8 mm long, rarely more, 1.5-5 mm wide. Since there is a voucher of var. fendleri from this trail, I'll go with that variety for now. However, keep in mind that no one may have reviewed this voucher for the variety after the presence of var. montanum was recognized in Arizona, and hence that variety might not be accurately determined. This species is a perennial, mostly found in the coniferous forests on the Rims, and just barely spills over the Rim into the Canyon here. 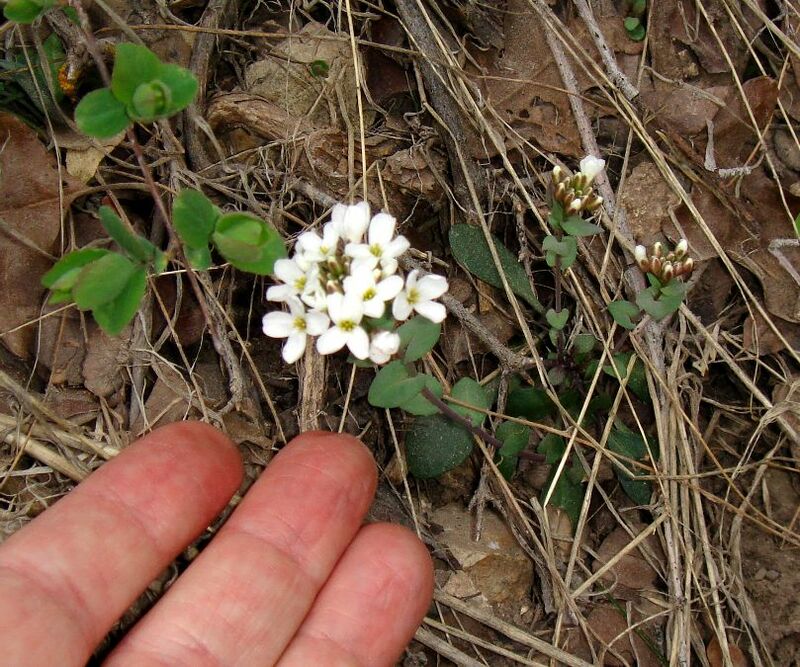 I thought these were very small milkmaids, Cardamine californica, when I first saw them. For more information on this species, and some beautiful pictures, see Southwest Colorado Wildflowers, Noccaea montana. From a SEINet search on 12 May 2008, there are 13 vouchers of this taxon (var. fendleri) from the Coconino County portion of the Grand Canyon, including one from this trail with an imprecise location. Note that there may be additional vouchers at other herbaria not available through SEINet. There are vouchers of var. montanum from South Rim, Picnic area; Between Jacobs Lake and North Rim of Grand Canyon; and from a number of locations in the San Francisco Peaks. 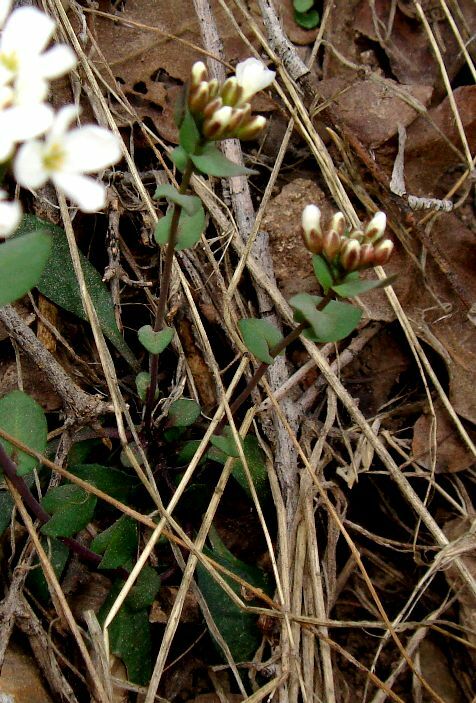 The only other Thlaspi species is the annual (or sometimes biennial) non-native T. arvense, pennycress, vouchered from South Rim, ca. 1 mi. West of El Tovar as well as on the Rowe Well Road. 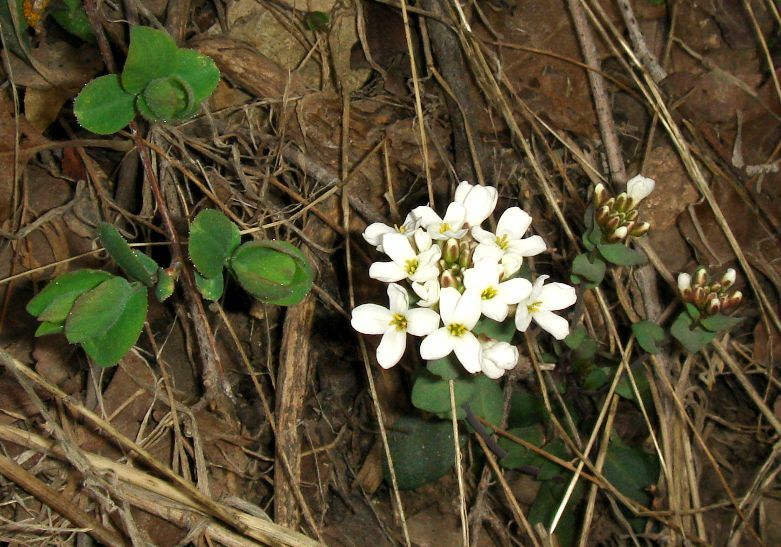 According to Kearney and Peebles, T. arvense is usually taller, over 30 cm, and branched, with dentate stem leaves. First occurrence on Bright Angel Trail: mile 0.59, elevation 6475 feet (1974 m). Number of plants along Trail: This is the only occurrence on the trail, and the plants are somewhat off-trail.